Traction – Beastly. No other way to describe it. Still not quite on the same level as the Air Jordan XX8 or Nike Kobe 9…but it’s REALLY damn close. There were times when dust was an issue — caused minor slipping — but there is so much aggressive traction available that even while in a slipping motion the coverage was able to eventually grip and hold enough to where you’re moving – whether toward the basket or around a screen — it was still strong enough to beat your defender. I didn’t enjoy how they played outdoors. Traction wasn’t as good and cushion wasn’t as good as Micro G. Plus the rubber is soft so if you do end up using them outdoors then expect them to wear down quickly. 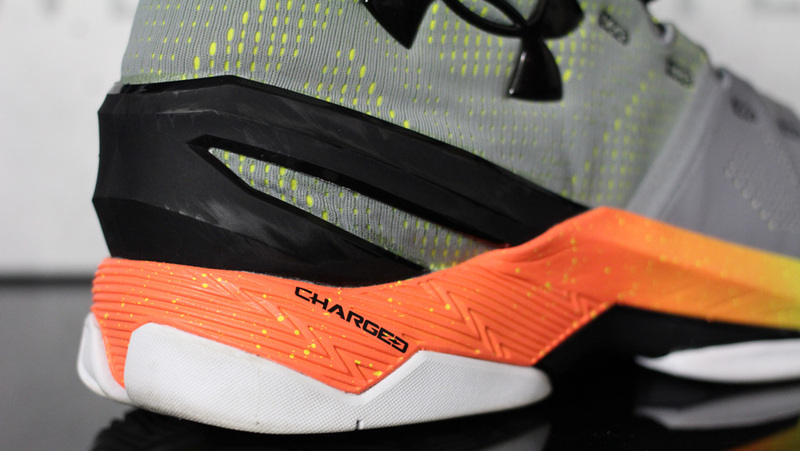 Cushion – Charged is used once again, and this time around it feels a little more plush than it did on the Curry 1. I still feel that Micro G is a superior cushion source, but if this is the direction Charged cushion is headed then I think we’ll all be perfectly fine. You have plenty of court feel so you can move with confidence as the floor and your foot feel connected, but if you’re expecting a bouncy ride then you’ll only get that from UA’s Micro G models…and they are now few and far between, unfortunately. Materials – I was really excited to hear SpeedForm would be used on the Curry 2…but I’m not in love with it. I like it, but I just don’t love it. The synthetic toe area does its job well enough, but I would have loved to have seen SpeedForm make a real debut on the Curry 2 instead of a partial debut. I realize the material could cause some support issues, but in the age of woven and mesh uppers being implemented properly…I believe it could have been done. At this point, I feel like anaFoam is a bit more superior in terms of overall implementation and support. Plus, I loved how the anaFoam gave you that custom fit once they were broken in. On the bright side, if you wear an ankle brace then they’ll fit within the shoe just fine. Fit – They fit true to size, however, they offer a pretty snug one-to-one fit. If you’re like me then you’ll likely love this feature, but if you like a little room in the toe area then you’ll want to go up 1/2 size. I did run into a small problem with the lacing system where the bottom lace loops caused some unwanted lace pressure, but it went away after some minor lace adjustments and a break-in period. Lockdown, due to the snug one-to-one fit, is pretty solid. Once the break-in period is over you almost don’t even realize that you’re wearing anything – which is one of the benefits of using something like SpeedForm. The ankle area conforms to your foot perfectly as the SpeedForm wraps around your foot and ankle, then allows that section of your foot to move freely without restriction. Support – Under Armour implemented your typical support features in the Curry 2. Midfoot shank? Check. Flat stable platform? Check. Midsole/ outsole that extends past the footbed that acts as an outrigger? Check. Heel counter? Check. One-to-one fit? Check. With all that said, the upper does lack some support due to the nature of the SpeedForm material. All heel containment and support relies entirely on the heel counter – which isn’t a bad thing – but the TPU used is a bit on the weak side. It’s a bit of a give or take thing with this shoe as it’s not built like a traditional sneaker. The rear section of the shoe is quite literally a sock with a TPU bar in place to keep your heel on the footbed. Make that TPU bar too rigid and you could cause discomfort with the fit. Too soft and your heel could roll over the footbed. It has the right amount of give to make everything work well enough as it is, but at the end of the day it’s still a minimalist approach in comparison to traditional basketball shoes. Again, not entirely a bad thing…it’s just different. Luckily it works, but for some, it might not be what you’re used to. Overall – The traction and fit are their best attributes, and that alone is enough to make these one of my personal top picks of 2015. Their support isn’t going to be for everyone, but as long as you know what you want and need from a shoe then you’ll likely make the right decision after reading through some reviews. Their Charged cushion will be a great option for Guards, but larger players might want to look elsewhere – especially if you want something with a little more spring or bounce back. Other than that, it’s a solid shoe that your average hooper will enjoy putting in their on-court rotation. The 2 lows are lookin sweet. Still waiting for a colorway to really make me want to pull the trigger but I did the same thing with the 1 so whatever. Lows just look better with UA models. Appreciate your review. It tells me the shoe is good, but not the shoe for me. just like with the Clutchfit lightning, they should have use the materials the other way around..
With the Clutchfit lightning, it will make more sense if they put clutchfit in the forefoot part and the synthetic at the ankle part. As always your review is straight to the point. what shoe would you recommend for a point guard, the rose 6 or the curry 2? Depends what is your budget and what attributes you are looking for in a shoe. Forgot to mention, Nightwing gets asked these questions alot and will say it’s decision you gotta have to make. I would say trying out each shoe on if they are available in stores in your area. That way it help you make a decision on top of info given by the reviews. if you are able to go to the store and try them on, then do it. you’d be giving yourself a lot of favor. Yo Nightwing! Great review, I thought these were gonna be beast, but then I guess it ok or above average. Anyways, I was wondering if your planning to review the clutchfit drive 2 highlight cuz those seems to have the materials done right. Perspective to this line is they are doing more different things and less of what works. Interesting if they can get more balance between the two. Understandable what they used synthetic at forefoot. Maybe using Clutchfit instead would have been better. they know how implement it at the forefoot for basketball use. Another great performance review from NW. Great review, and was that a Fantasy Island reference??? Anyway, I played like 6 hours in them and it takes some break in time as my achilles were aching and red. Similar to Curry 1 except materials and cushioning is a bit softer on the 2; I actually like charged more than Micro G… specifically, I’m not a fan of the Micro G insole as it gives me arch pain. Overall, I really like the Curry 2 except the materials. Between both Curry models, it’s a toss up to me. I’ve no problems with the lacing and I tie my shoes tight and I use all the eyelets. I think my foot is average to narrow so I rarely have problems with the forefoot area. Generally, I do get pain in my achilles and also the front part of my left ankle; not sure why… However, most shoes need break-in time. As for the Currys, I prefer the Anafoam in terms of “quality-feeling” materials, but I must say the forefoot fuse on the Curry 2 seems to be breaking in really nice as it’s starting to feel more flexible than the Anafoam. I believe NW is correct that the Anafoam gives better overall support compared to the Curry 2’s. However, give the Curry 2 some time and I think you will like them. Thanks. I balled for a few hours Friday in them. Thought the laces were going to bother me but I didn’t feel them once. I also lace tight. The top collar around the Achilles does cut into you some, bothered me a little. While playing the cushioning felt great, but the first thing I noticed when I stepped on court was the traction. These things stick!!! The shoe to me also felt very “one on one” with my foot. The d rose I have to wear two pairs of socks because the laces below mid foot hurt and there’s a lot of extra space!! The ankle and top tongue is a little too padded for me, traction was good, of course the boost is awesome but I felt the court and my movements a lot better with the curry. D rose also feels heavier. I thought I was the only one with the arch pain from the Micro G insole. I have the clutch fit lows and love every aspect except my arches hurt like hell. I was going to do a swap tomorrow and try again. I don’t have this issue with my old Torches though. I have the Anatomix Spawn Lows and my arches kill me. For me, the culprit is the Micro G insole. I swapped the insole with the inaole from my Venomenon 5s and the arch pain reversed… meaning no pain in my Spawn lows without Micro G insole but pain in my Venonmenom 5s with Micro G insole. I guess the question is… who wants a pair of Micro G insoles? ^It’s a toss up between the 1 and 2 for me as well. Anafoam feels more natural and comfortable to me while still containing the foot. But the updated traction and added bounce from the foam are pros on the 2. ^^^I second this exactly. I love the anafoam on the 1s. Traction and cushion definitely an upgrade on the 2s. I also love the anatomix spawn lows. Their one of my fav ball shoes. I don’t get any pain, and I actually really liked that micro G setup. I had a pair of 29s and crazy lights that gave my feet, heels and Achilles nothing but pain. Hey Nightwing, so in your opinion, which shoe is best for a point guard? The D Rose 6 or the Curry 2. And which one did you prefer personally? I have worn and then like this shoe, albeit for the perimeter. It does not have enough beef for being in the paint, under the basket play. The lighter shoes do not support the foot well enough to protect from impact, the real dirty work underneath. Great review Nightwing, considering I was not able to find a pair of the Curry 1’s in my area, I had to jump on getting a pair of the 2’s were. So far, from what you and others have experienced, I had no issues with the tightness from lace loops below. I did find the traction and support to be great, lots of room and flexibility in the tongue to fit a ankle brace on if needed. As for the cushion, I haven’t had the chance to play in any micro G shoes, but am a bit disappointed with the Charged foam. I don’t get that cushy feeling if I’m standing in them or just walking, having played in them 5-6 times now, they just feel firm to me like compacted lunarlon with little to no spring back. Kinda related Nightwing, any suggestions for a shoe with some thicker cushioning? Seems like all basketball shoes now are trending more towards the low profile, low to the ground, with great court feel cushion. I have knee problems and play on a court with really stiff wooden floors, so I’ve been trying to find a shoe that will give better cushioning. Update. Been wearing the father to son for about 3 weeks, only indoors 2-3 times a week. Part of the sole is detaching already. UA said they’ll replace the shoe but I really like this colors and may stuck with it. Y’all need to talk about rollover factor in your reviews. Saying “support” isn’t enough. When you stand in place and attempt to turn your ankle over, what happens? Does the shoe roll over easily, or does it hold? Put on a pair of those old Kidd’s with the chrome ball thing on the side and you will find it IMPOSSIBLE to roll the ankle unless you land on something or fall at an extreme angle. This is a major oversight with shoe manufacturers. Another thing, orthotics. How do, e.g., Superfeet greens perform in these shoes? We need more performance data. We don’t discuss orthotics because we don’t wear them. However, we do suggest that you bring your orthotics to the store to try on shoes to see what they’ll work with. Same if you wear a brace. Wear to the store and try on the shoes to ensure proper fit. As for the rollover factor, no shoe will prevent an ankle injury like that other than Ektio – which was stated in the Ektio reviews. So if you choose to play in anything but Ektio then you can assume that you have a chance of rolling an ankle. No shoe is safe from landing on a foot though. Lows help IMO. Anytime I’ve landed on a foot in lows it’s allowed the ankle to roll quick and smooth instead of trying to restrict the movement thus preventing an injury. We also discuss when a shoe has a nice wide base – like the Kidd’s you’re talking about. The wider the base or platform then better overall stability you have. These are things we discuss. It’s up to you afterward to retain the information and apply it to your shoe shopping needs. We try our best to teach about performance to help you make an informed decision. We do not hold hands throughout a purchase. Thanks for the review, ended up getting these based on your review! However, I have been wearing low tops forever, and am not used to how high they are just yet. Did you end up lacing these all the way to the top eyelets or did you just lace them up to just the 2nd set? If you could tell me what shoe would be the best for me, that would be great. It doesn’t have to be on this list, I’m always exploring my options. I had high hopes for this shoe. It felt good walking in them but when I played in them it was a different story. Charged foam is hard. My heel started to hurt aftet a while. MicroG is still the best. Also the lockdown was not great. Its true to size but I felt my foot sliding around on hard stops. Clutchfit Drive is a way better performance shoe. But the Curry 2 has better traction. It’s hasn’t happened to me (for the low top) and those are one of my most worn pairs, but the rubber is soft so it’s not surprising. Esp if you heavy footed. Finally bought some Currys.. I got the gray storm mids, and energy lows. Must be my wide feet, because they fit me perfectly.. the lows are a bit snug in the toe area though, just had to loosen up the laces a bit.